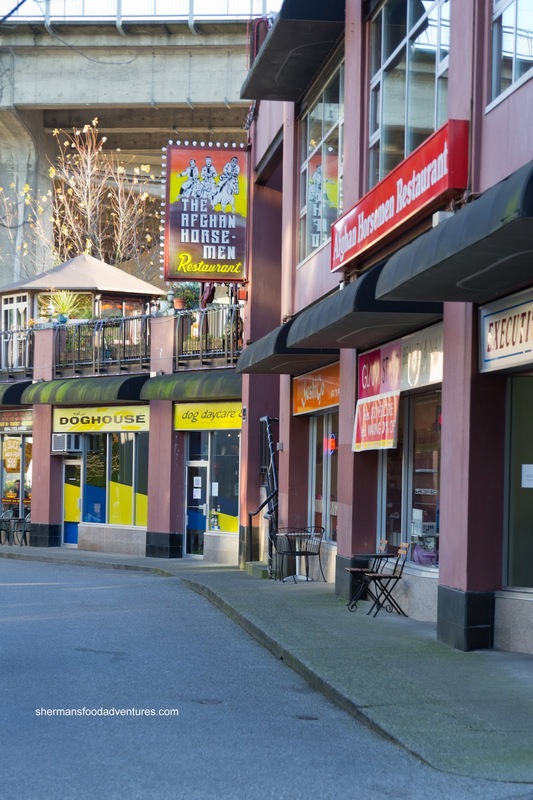 It's no secret that Vancouver is known for its culinary diversity... in Asian food. When it comes to every thing else, there are a decent amount of Greek and Italian restaurants, but not much else. 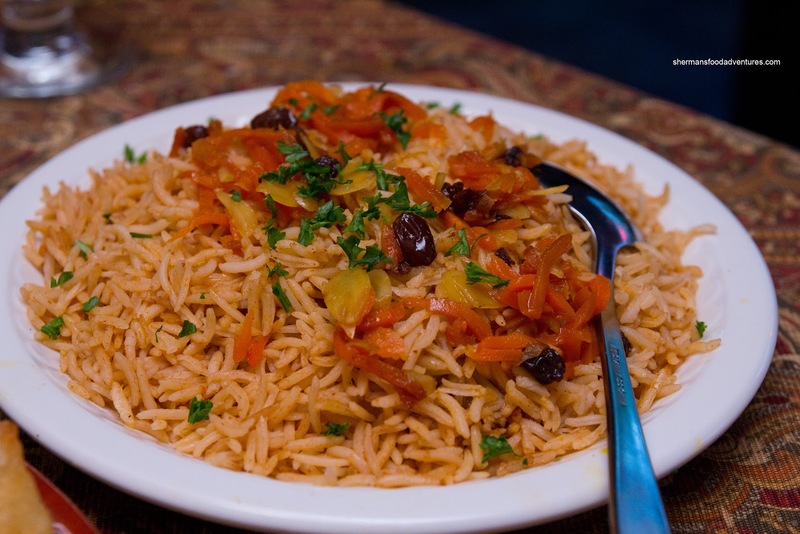 One particular cuisine, that is as rare as a safe lane change in Richmond, is Afghan food. One could literally visit all the Afghan restaurants in less than one week. And some stretch the genre. I've been able to blog about Afghan Chopan in Surrey and the now defunct Khyber Pass, yet not the granddaddy of them all - The Afghan Horsemen. Hey, I've been here several times in the past, but that was way before this blog existed. 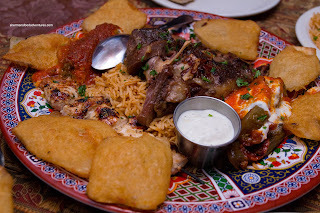 Since Afghan food is best when shared, Viv and I met up with Costanza and Elaine for some carnivore-action. To get a taste of everything, the best course of attack was to get a couple of their platters. 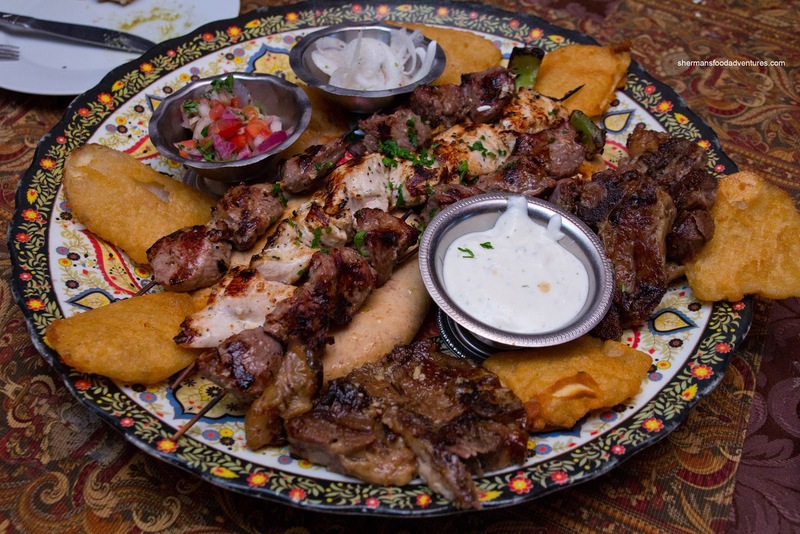 We got one each of the Horsemen's Special Platter and Kebab Platter Delight. To start, we were presented with Whole Wheat Pita Bread accompanied by Humus and Sabzi Mast and Salata with Feta Cheese. 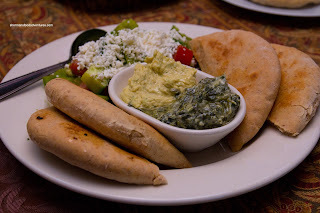 The pita was served soft and warm, yet I wasn't a huge fan of the humus nor the sabzi mast. I didn't find them all that flavourful. The humus was garlicky and had some texture, yet there was little else. The sabzi mast was very mild, but it was smooth. 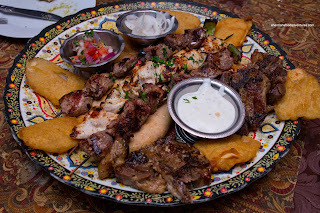 The first platter to arrive was the Horsemen's Special Platter consisting of Boneless Chicken Shish Kebab, Lamb Shish Kebab, Lamb Shoulder, Baked Rice, Baked Eggplant, Dolmah (cabbage roll), Pakawra (batter fried potatoes), & Chaka (sour cream & yogurt dip). Oddly enough, when the Kebab Platter Delight arrived, it appeared to have almost double the amount of meat of the other platter. Therefore, we were perplexed that it was only $4.00 more. Whatever the case, the lamb was moist and exhibited a nice roasted appearance and flavour. It was fatty and gelatinous with a nice bark. The kebabs were nicely charred and moist (except the beef was slightly dry). The rice was a disappointment as it was bland (where there weren't enough sweet raisins or carrots). Texture was okay though. We found the potatoes to be crunchy with kick, yet very greasy. Usually, it is about here that I might compare Afghan Horsemen to another restaurant. Well, the only other equivalent is Afghan Chopan, which is probably a bit better due to more developed flavours. 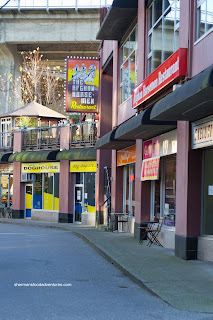 However, Afghan Horsemen is still okay considering they are the only large Afghan restaurant in Vancouver proper. Agree with all you said. I found their food greasy and somewhat on the bland side. Like a meh Greek meal.